Hey folks, this is le jester over here. Today I am gonna enlighten you about the playstyle of link jokers and reverse cards such as Vowing Saber Dragon Reverse. So who are the Link Jokers? see the similarity in the art? The forerunners of "Link Joker", which is the incarnation of "Void" and the invaders threatening Cray. Their main mission is to investigate the indigenous creatures and collect the data of powerful beings, and dominate their bodies if possible. However, it is said that they would annihilate weaker beings in the process, finding their data not valuable enough to be collected. They possess multiple technologies that do not exist on Cray, and can manipulate the mysterious power "Lock" freely. So what is the playstyle of Link Jokers? Link jokers revolved around locking your opponent units similar to binding them in the rearguard circle which would stun your opponent and disable the card's potential and ability it has on the rearguard circle. Link jokers often goal and objective is to disrupt your field, at the same time stunning you and limiting your actions for subsequent turns. This lock ability not only immobilize and stun your units, it also allows themselves to gain card advantage through the locking. 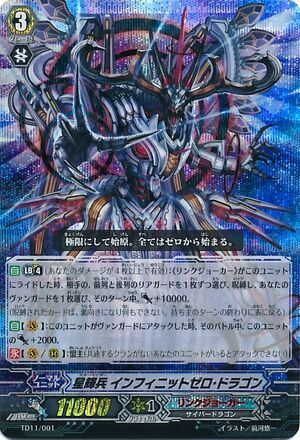 Imagine, if your opponent front row interceptors got locked, Logically, they would need to guard their vanguard with cards from their hand, which eventually reduce their handsize. At the same time, it also help them conserve their handsize as they have to guard for lesser attacks and smaller attacks that will eventually give them enough time to gain a larger handsize than your opponent. What is the "lock mechanism"? When a card is affected by lock, it is turned face down until the end of its owning player's turn (the card remains where it is). A unit turned face down by lock cannot be used to perform any action; it cannot attack, boost, use skills, be used to pay a cost, move to another circle or zone (including intercept) or be retired by calling another unit over it. The card is not considered a unit and the card and the circle it is on are considered to not exist for the duration of the lock skill. When a unit is unlocked, it is not considered to be called back to the field, and thus on call skills are not activated. 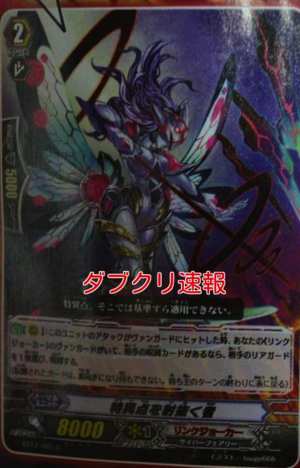 Lets take a look at the badass cards that link joker has to offer to us. 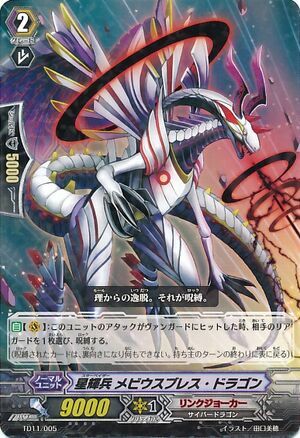 So what happen if I were to Break ride a Nebula Lord Dragon on an Infinite Zero Dragon? Obviously, you would want to lock the vanguard booster and a one attacking front row with IZD's effect. Next I would want to lock the backrow of one of his attacking rearguards.Thus, Your opponent has an 11k attacking vanguard and a 12k attacker. 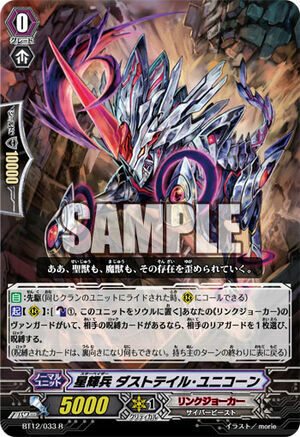 Next, with a Nebula Lord Dragon's effect, it gives a 3k power to all your front row attacking units for each locked units your opponent controls, This easily gives you at least a + 6000 power to all your attackers. 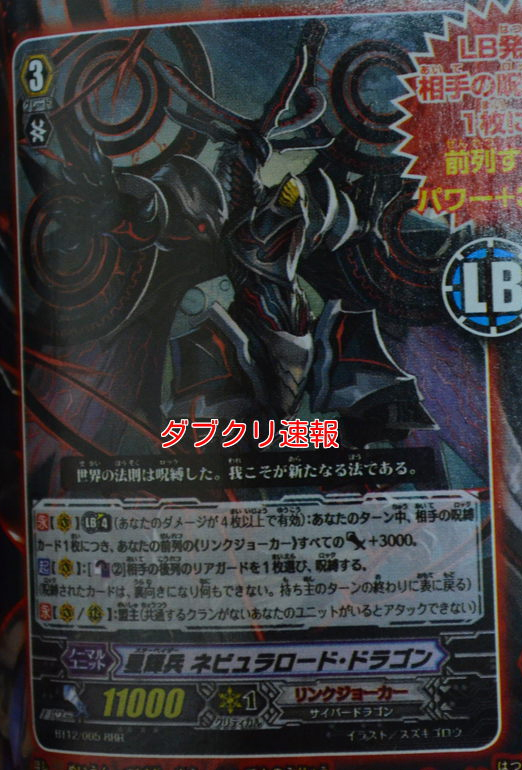 Wait isn't this better than the celestials? Now, lets do the math behind it, How much must your opponent guard during your turn? Assuming you have an 8k booster behind every column and a NLD that broke ride this turn, along side with a 12k attacker rear and a mobius breath dragon too. Also to add that your opponent has 3 locked units. R1: 9k Mobius + 8kboost + 9k NLD effect = 26k column PERFECT NUMBER! 20k GUARD! R2: 11k Vanguard + 8kboost + 9k NLD effect + 10k 2trigger check = 38k column. 30k NO PASS! R3: 12k attacker + 8kboost + 9k NLD effect = 29k column. 20k GUARD! Now, lets do the math behind it, How much do you have to guard for your opponent's turn? Assuming opponent has only 2 cards in his front row to attack and controls an EDD. Lets now imagine.... FINAL TURN! R1: 12k unboosted attack = -1 from hand for a 5k shield. VG: 16k descendant with especial CB = -15k 2trigger pass, 20k No pass. 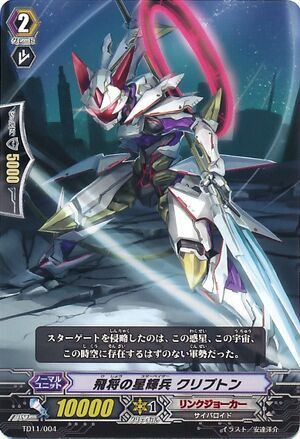 Restand Vanguard: 26k with 2 triggers: 25k 2 pass, or 30k No pass. Or KANZEN!! Total damage you need to guard: 5+ 20+30 =55k. So who are their key minions? How do i deal with these pesky jokers? So these are the rearguards ya gotta look out for. Dust-Tail Unicorn is annoying, Kill him fast with your linchiu or by the turn that he rides nebula lord dragon. So we got 2 different pressure units to play with. Mobius and Singularity. 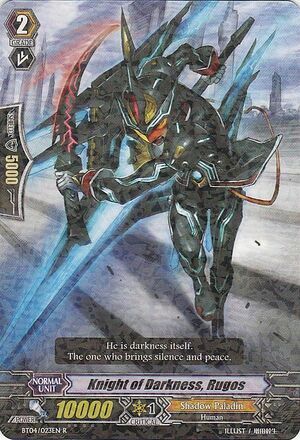 Mobius is an on hit effect, guard him during the turn your opponent ride his as a VG. Do note that he can target any rearguards to lock, which would give Singularity an effective early game pressure to lock more of your units. YOU MUST BE HIGH TO NOT GUARD. Singularity is only effective when ya got a locked unit. 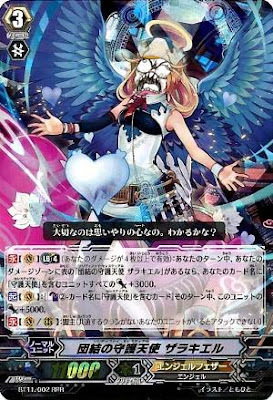 Otherwise it be a waste of deck space to run 4 of her in your deck, what more its a puny 8k beatstick. However look at it this way, They will need a NLD to turn on the pressure cooker on you where ya gotta guard its additional power that all the front row gains when he rodes on IZD. The real threat of the Deck is actually NLD and IZD who can start turning on the pressure in you with the locks. So in other words, They need to start a chain of locks with the vanguard's ability. In this case, If they were to fail to ride an IZD, they would need to depend on their CB 2 to start screwing up your field. So in other words ya might wanna control their damage and do not give them a chance to counterblast and start the chain of locks and pressure on you. Note that Link jokers rearguards do not use counterblasts at all with exception of dust-tail which is CB1. So how do i counter them? Hmm this is when you play decks that restand the vanguard or decks that do not focus too much on the rearguards or rearguard dependent. Decks such as DOTE, ERADICATORS are barely affected as LJ only focus on crippling your rearguard. Decks that allow your vanguard to hit High numbers are best against them. So no worries readers, your DOTE and ERADICATORS are still badasses that can screw the jokers up.